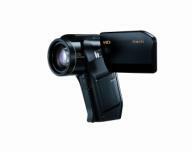 Sanyo announced the debut of a new HD camcorder branded the “Xacti” HD1010. The lightweight high-definition camera has a resolution of 1920 x 1080i and features face detection technology to improve both video and stills. Best of all, the records in slow-motion at 300fps (frames-per-second). The “Face Chaser” technology monitors the lighting on up to 12 faces at the same time and automatically adjusts for maximum quality. The 1080i video resolution is shot at 60fps in normal mode, 300fps in slow-motion mode. To improve video quality, the codec algorithm has been improved from 12 Mbps to 14 Mbps. Another feature to note is the ability of the Xacti HD1010 to do 7-frames-per-second sequential shooting, which allows up to 7 still images for action photography. The still images are recorded at 4.0 Mega-pixels, unless you are shooting stills at the same time as shooting video in which case they are recorded at 2.0 Mega-pixels. Other features include HDMI output, a 2.7 inch rotating widescreen display, image stabilization, and recording to SD/SDHC memory cards. The camera can store up to 87 minutes of 1080i video on a single 8GB card. The SANYO Xacti HD1010 will be available in the U.S. next month and has a retail price of $799.99. Next Next post: YouTube higher resolution &fmt=18 a hack?